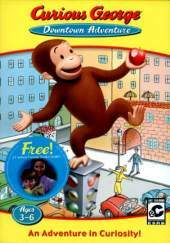 When Curious George and the Man With the Yellow Hat venture into the city one day, the Man foolishly leaves George alone while he goes off to shop for shoes. Curious George has a curiosity streak a mile wide that no admonition can suppress, and when he sees a crowd gathered he just has to investigate. George's actions precipitate a series of little disasters which he must set to rights. The game begins with an illustrated narration and then moves on to the first puzzle in the game, where the narrator guides the player through a mini-tutorial. The puzzles are very much like "Rube Goldberg machines", similar to The Incredible Machine series of games. Items must be arranged on the screen in a cause-and-effect manner to accomplish certain tasks. More items are collected as each of the 60 puzzles are solved. Each successful puzzle awards bananas which are considered the player's "score". Recommended ages for this game are 3 - 6 according to the publisher, however, the puzzles can be confusing. Luckily, the game offers hints on each puzzle page, allowing even the youngest player to complete each task. Player Achievement certificates, based on the player's progress, can be printed out. The game also features an "Open Play" mode where the player can design their own puzzles.